I think I could have stuck a few more ‘F’s’ in there—like ‘French’ and ‘Family’, but I’m getting a bit carried away with my alliteration. Anyway, I love fall. It’s my favorite time of year for many reasons, one of which is that there are so many great things to do outside. It’s not too hot, not too cold, not (usually) too rainy, and nature provides plenty of free entertainment. 1. Leaf collecting – I did this when I was a kid, and I’m keeping the tradition going with my children. We have plans to identify the leaves we bring back and keep a “leaf book” where we have a different page for each kind. Making the book together is an inexpensive project to do with kids. 2. Mushroom hunting – I must confess, I don’t like to eat mushrooms. At all. But going out in the woods with your basket in something of a French tradition, and my husband is enthusiastic about both hunting and eating them. He bought a guidebook to identify which are edible, and every pharmacist here is trained to help you sort the good from the bad. We saw quite a few different varieties the last time we went out. 3. Chestnut gathering – Now this is a fruit of the season I can get into. I love eating hot roasted chestnuts at the Christmas market in December, and although I haven’t tried roasting my own at home, I’m hoping to gather enough to do so soon. I never knew much about chestnuts before moving to France, but there are two sorts—marrons and châtaignes. The latter, smaller variety is the one you want for roasting. 4. Apple festival – There’s an annual apple festival in a little town about an hour from where we used to live in the States, and it was a great place to have some inexpensive fall fun. We used to pick our own apples from their orchards, fill up on fried apple pies and cider, take a hayride, and watch the local clogging group perform. 5. 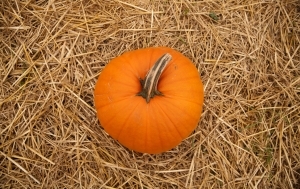 Pumpkin patch – Picking out the family pumpkin to carve or decorate for Halloween is a great fall tradition. I’ve tried recreating it here in France, but to be honest our selection of pumpkins is pretty pathetic. Plus, we don’t usually have trick-or-treaters, so no one is going to admire it except for us. What about you? What activities and traditions do you have for taking advantage of the fall season? My kids and I take the seeds from our jack o’lanterns and roast them. I rinse as much of the actual pumpkin off the seeds as I can, then place them on a cookie sheet covered with parchment paper, spray them with a little oil, and bake at about 400*F for 20-25 minutes. We did some frugal decorating at our home… a couple of inexpensive items from the dollar store really set a nice tone in the house.